Researchers aren’t sure what all goes on inside and beneath glaciers, but a UO oceanographer is helping shed some light on this hydrological black box. To do that, oceanographer Dave Sutherland has been going nose to nose with LeConte glacier in southeast Alaska. A recent article in Eos, the magazine of the American Geophysical Union, describes the effort by Sutherland and his team to learn more about how glaciers melt and what effect the meltwater has on the huge river of ice that extends out into the sea. Sutherland has spent several seasons floating just off the face of the glacier and sending drone boats in for closer measurements. The team wants to know what happens when meltwater coming from under the glacier hits the bay and what effect that has on the rate at which the ice melts and the breaks up. The work came with some risks, since the team worked close to where huge chunks of ice regularly break off the toe of the glacier and drop into the bay near the research vessel and its drones. With most data now in hand, analysis is now underway. For the full story, see “Science at the Border Between Ice and Ocean” in the December issue of Eos. 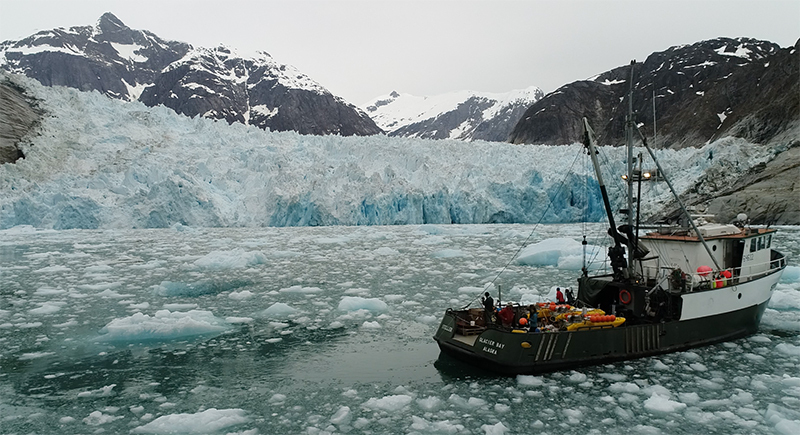 A related Around the O story, “Glacial ice is a way of life for UO oceanographer,” provides additional background. Sutherland is a physical oceanographer who uses observations and numerical models to explore coastal and estuarine systems. In particular, he is focused on the dynamics of glacial fjords and Pacific Northwest estuaries and how humans interact with those environments.